In most cases, you don’t need to import users to the O&K Print Watch database before you can control and monitor their printing activities. As soon as someone prints a document, he or she will be automatically added to the database. Moreover, if O&K Print Watch is used with Active Directory, all users and user groups in the domain can be automatically synchronized with the O&K Print Watch database. LDAP path. 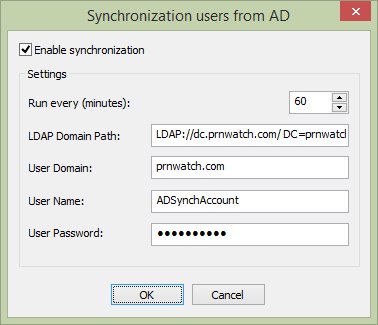 For example, LDAP://dc.prnwatch.com/DC=prnwatch,DC=com. User domain. For example, prnwatch.com. Active Directory user name. By default, the O&K Print Watch service runs using the System account, so it cannot access the network. To allow synchronization with Active Directory, you need to specify an account that has Read access to Active Directory services.